Though it sits directly across from the beach, Viceroy Santa Monica’s seductive, high-design aesthetic means the ocean is just one of the attractions of staying here. A fine dining restaurant anchors the lobby, and there are stylish cabanas that are bigger than most guest rooms. 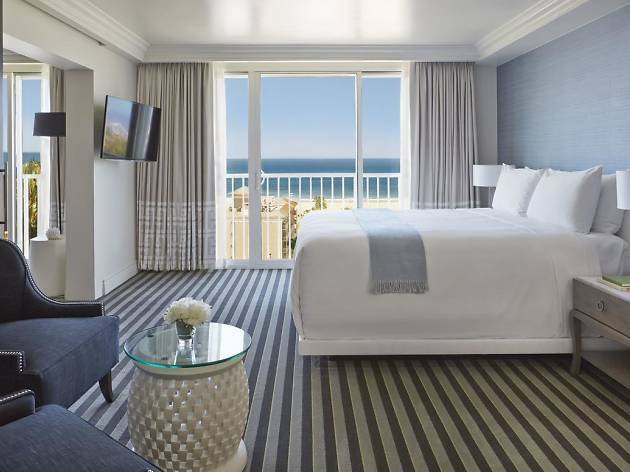 Beachy, elegant and squarely aimed at the luxury market, the Viceroy Santa Monica conjures a well-sequestered coastal retreat, with impressions of being on the French Riviera. Against lush green hedges in the garden, the hotel’s signature black-and-white cabanas are striking; it’s here, at night, that guests like to linger among the candle-lit pathways, sipping champagne by the plunge pools. The lack of a real pool is justified by the hotel’s proximity to the beach (across the street), and there are bike rentals and beach fitness classes to help you get into the SoCal spirit. A $28 amenity fee might be overkill, since all it really includes is a welcome glass of prosecco and morning coffee (but not breakfast). 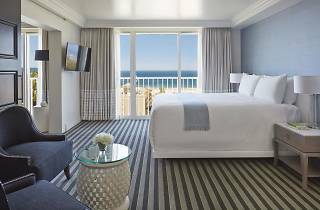 Rooms are bright and bubbly, with crisp white linens and walls that match the color of the ocean right outside your balcony (suites get you coffered ceilings and jacuzzis, not to mention twice the space). Tech amenities like bluetooth speaker alarms and Sony TVs with media hookups mean there’s more here than just pretty views, though the focus remains fixed on the 3.5-mile beach that doubles as your front yard. Location: The Viceroy benefits from being on the quieter side of Santa Monica Beach, surrounded by a few other high-end hotels, though never far from the excitement of Third Street Promenade and Santa Monica Pier. The newly opened Downtown Santa Monica metro stop offers a direct link back to downtown LA. Third Street Promenade: Packed with shops, restaurants, frozen yogurt vendors and an always entertaining lineup of street performers, this open-air mall is worth the 15-minute stroll from the hotel. FIG: A mile from the hotel, Santa Monica’s most vibrant Middle Eastern-inspired menu offers a wood-fired “bread balloon,” which is perfect for dipping in all the different mezze bowls that come with it. Santa Monica State Beach: Just outside the hotel, you’ll spend hours strolling the length of this enormous beach, which is typically the main attraction for visitors to Santa Monica; along the way, stop in at the various video arcades, fortune tellers and fairground rides offered at Santa Monica Pier. Santa Monica Farmers Market: Less than a mile from the hotel, this yummy congress of food vendors takes place every Wednesday, Saturday and Sunday, and has become the most in-demand farmers market in all LA, with prominent chefs stopping here to pick up their basil, leeks, berries, spices, and seafood fresh each week. Good for: Beach fanatics who like a touch of luxury when they’re not splashing in the waves. Viceroy positions itself as a beach hotel, but with a high-end restaurant and a swanky cabana scene, it’s intended for couples and well-behaved families (the cocktail culture around the pool area might make it a bad fit for young children). Time Out tip: While a (more expensive) “bed and breakfast” rate is offered to factor in a morning meal each day, the hotel’s amenity fee actually grants you 10% off the restaurant, so you’ll be able to save more that way; especially if you keep your breakfast limited to smoothies and quinoa bowls.